One of the best aspects of supported rides is just that: support. Sign up, get your booty out of bed in the morning, pump up your tires and go. Take off, and ride. Without a care in the world. Well, it may not be exactly that magical, but there is indeed a team of magicians behind the scenes making events amazing. We have them to thank for our incredible ride experiences all season long. We recently sat down with our friends Daniella and Elliot Crowder of Oregon Rides to find out more about what they do. 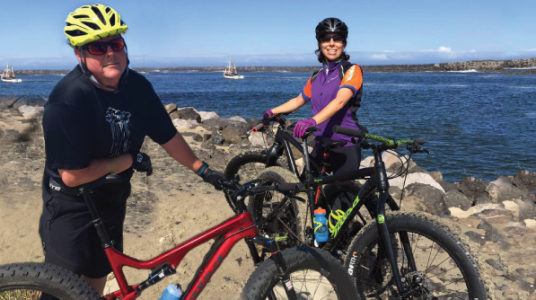 Oregon Rides is the company behind Arthritis Bike Classic, Coast Hills Classic, Barrel to Keg, Mo’s 70th Anniversary Ride and many other regional rides. So just how did they get into this crazy world? What’s your favorite aspect of being an event coordinator? Seeing all of our months of planning, preparation, mapping, routing, etc. come together into a seamless event that the participants truly enjoy. What event do you dream of running? We have dreamed for years of having a fat tire festival on the beach where we have some fun races, bike demos, beer, music, and family fun – and we are in the planning stages for that to occur in 2018. Stay tuned for more info! What are the biggest challenges event coordinators face? Weather and things out of our control! You can plan a perfect event and if a storm, fire, or days of rain come, it really puts a damper on everything and makes the experience much more difficult for staff and participants. You can forecast as much as possible for every thing that may occur but Mother Nature has the final word. This was a challenging season for many events. What were some of the largest challenges you faced? The weeks before our six-day Arthritis Bike Classic, the wildfires were raging near our starting point and the smoke made it unhealthy to ride. We had to make a very difficult decision: to cancel the ride or move it to a part of the state that did not have heavy smoke. What took us nine arduous months to plan, we had nine frantic DAYS to re-plan. By some miracle we were able to pull it off and have a successful event. As a smaller scale event (less than 100 people) and because we have great Coastal connections, we were able to pull this off seamlessly. Tell us a little bit about coastal bike life. We are all about fat tire bikes here! We love how they can take you on every terrain possible. Sand, snow, mud, trails, dunes, desert – fat bikes roll wherever you can imagine! We have opened up so many more miles of riding into our lives by being able to ride our bikes on the beach and foredunes. We are just beginning to scratch the surface of what Oregon beaches we can ride. We also have some great mountain bike trails in our area and are working on building even more. We are excited to help people bring their bikes to the beach and enjoy everything the Coast has to offer. What’s on the horizon for your 2018 event season? We are heading down to Baja with our fat bikes to explore the best beaches to ride and plan some tours. We are also planning some guided fat bike tours on the Oregon Coast. We are just negotiating several new contracts for events we hope to be involved in for 2018 and should have our new schedule of events set by the New Year – stay tuned! We appreciate all the work event directors like Daniella and Elliot do to give us great rides. We can’t wait to see what you all bring us for 2018! To learn more about Oregon Rides, check out their website.